KINGSTON--U.S. Army National Guard Staff Sgt. Kristin Northrup a survey team chief and Spc. Sean Murray a survey team member assigned to the 2nd Weapons of Mass Destruction Civil Support Team (CST) move to inspect scan and catalog the contents of a simulated bomb makers vehicle during a hazardous materials exercise with the City of Kingston Fire Department in Kingston N.Y. Nov. 28 2018. 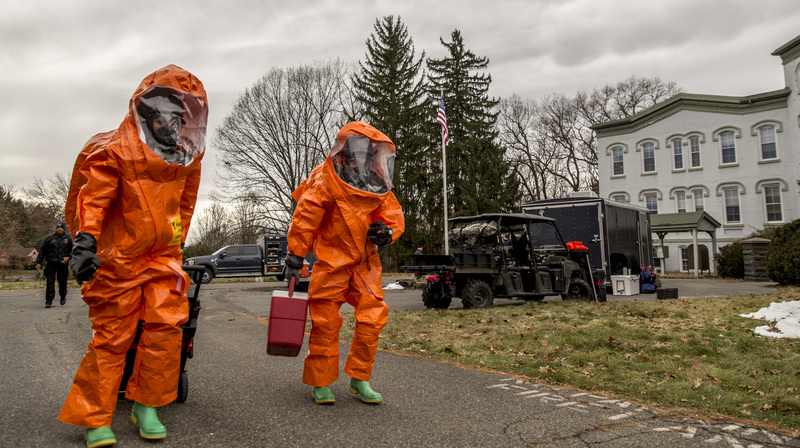 The 2nd CST based in Scotia N.Y. is trained to identify and respond to chemical biological and radiological agents and advise first-responders on how to deal with those threats.